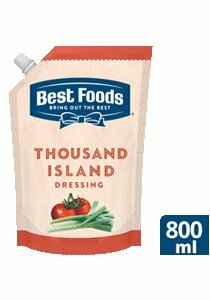 Thousand Island dressing is a ready to use dressing made with soybean oil, eggs, vinegar, relish etc. It is perfect for salad binding and dressings application with a soft texture and visible inclusions of leeks and relish. Contains Egg, Mustard/Mustard products and Peanut Oil. Store in a cool and dry place. Refrigerate after opening. Do not freeze.